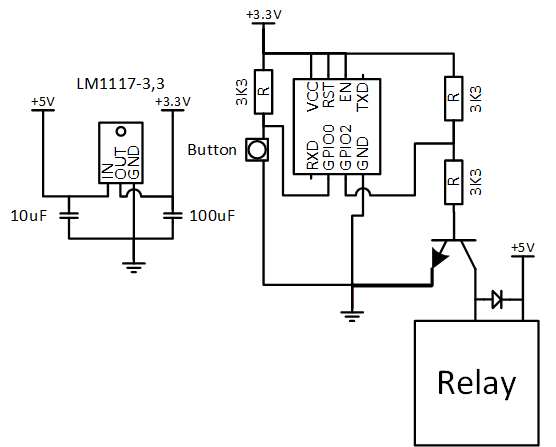 I want to have an ESP8266 (ESP-01S), which has only GPIO0 and GPIO2 exposed, drive a relay (via an NPN Transistor on GPIO2) and read a button (GPIO0). The problem is that as soon as I connect the red line, it looks like there is not enough power delivered by the PSU. Even without the relay, it looks like the LM1117-3,3 is going into thermal shutdown after a couple of minutes. The problem with the ESP8266 is that GPIO0 must be HIGH and GPIO2 must be HIGH when it powers on, to get it to boot successfully. It works perfectly for the first couple of minutes though, so I know the code works fine. What am I doing wrong? Should I up both the resistor to 10K from the 3K3 that I have now? 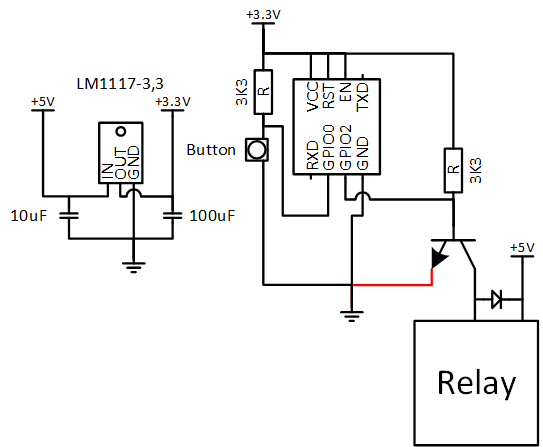 Okay, so the following circuit solves the booting problem, but the LM1117-3,3 overheats and shuts down. I've added 3K3 resistors inline with both the chip_enable and reset lines. It seems to work fine now, for a couple of minutes, then the ESP8266 seems to shut down and then only the LM1117-3,3 seems to get very hot quite quickly. Is this some kind of sleep mode/Should I add more delays in my loop so it runs slower? Surely not? Replace connection GPIO2 to base with 470Ω to 1kΩ. GPIO has low impedance driver (~25Ω) so (3.3-0.7)/25 = up to 100mA ! into base ! n.g. This is why a series R about 10x the relay coil resistance is used. Include Red line emitter to ground. It seems the circuit in my first update was the correct version. The only additional bits I have in my circuit over and above the diagram above is the 2 addition 3K3 resistors between Vcc and Reset and Chip Enable. The overheating issue seems to have been the output capacitor on the LM1117-3,3 being the wrong way around. Thanks to all the input though, it got me thinking in the right direction. Not the answer you're looking for? Browse other questions tagged relay button esp8266 or ask your own question. 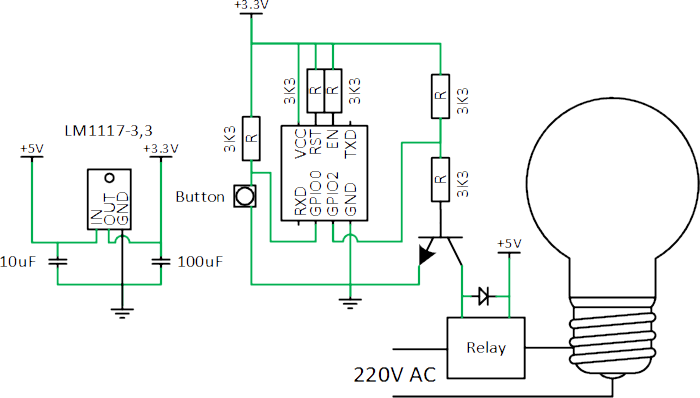 Any clever way to provide 3.3V with good current output from a 9V battery?